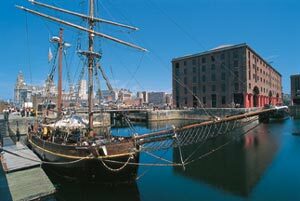 Liverpool was a pioneer in the development of modern dock technology, transport systems, and port management. The Albert Dock is a truly stunning architectural triumph. Opened in 1846, it soon became a treasure house of precious cargoes from all over the world. The five impressive buildings which form the Albert Dock complex stand as a reminder of Liverpool's history as a great and prosperous port.Today redevelopment has transformed it into one of Liverpool's busiest and most cosmopolitan centres and a top heritage attraction. However, docks built to accommodate sailing ships could not provide deep enough water for the new steamships, and after 1890 trade declined, leaving the Albert Dock largely disused until its closure in 1972.